After living in apartments for many years, one of the most exciting things about a single family home for me was having my own in-house washer & dryer. In fact, our current home even has a cute little laundry room. 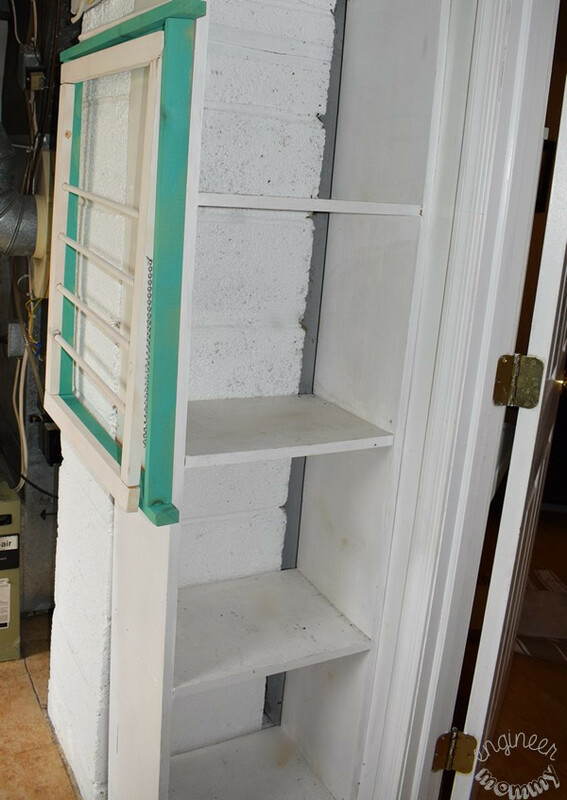 It’s nothing fancy, but it has a full-size washing machine & dryer, along with a super useful set of shelves. Today, I am going to show you how I spruced up the space easily & affordably in one afternoon. I have always said that when it comes to laundry, it’s important to stick with products that work well. 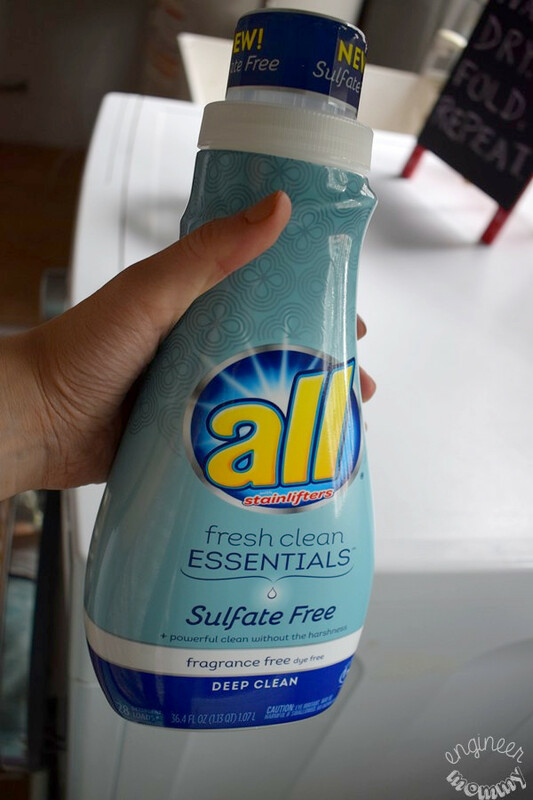 That’s why I have been using the new sulfate free all® fresh clean ESSENTIALS® – it works effectively & gently on my family’s clothing. 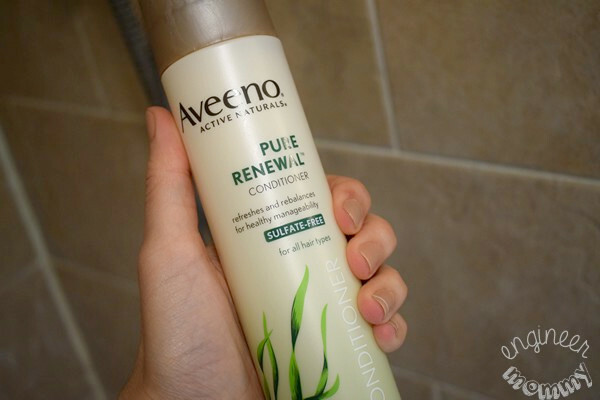 Speaking of sulfate-free products, I’m also making the switch over to AVEENO PURE RENEWAL® Shampoo & Conditioner. By choosing products that are free of sulfates, I know I am making a positive, healthy difference in my family’s lifestyle. 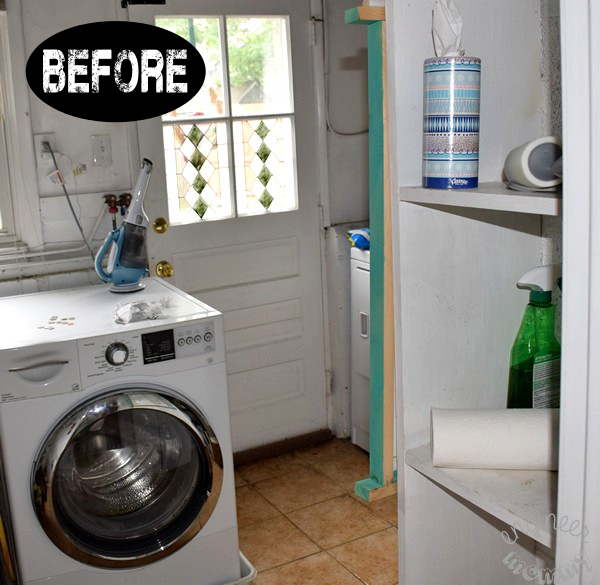 Now, let me tell you all about my laundry room makeover! Before embarking on any room makeover, it’s important to start by evaluating the room. I like to pause and see what’s working and what is not working. Here is the view of the laundry room from the door. You can see the washing machine right in front and a set of shelves on the right. Let’s take a closer look at the washing machine. I have started to collect loose change and receipts on top of the washing machine (as I empty out jeans pockets before placing them in the machine). 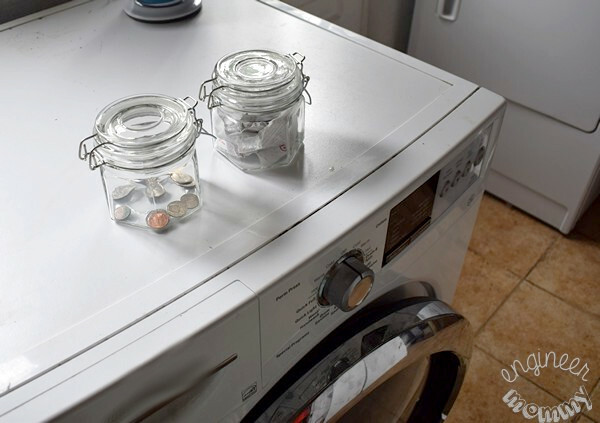 It’s convenient to place these items right on top of the washer, but it’s definitely an eyesore! Now, let’s take a look at the set of shelves more closely. As you can see, I have a bunch of random stuff on the shelves: iron, some cleaning products, a bunch of single socks (that I couldn’t find a match for), a lint roller, and all® fresh clean ESSENTIALS®. These shelves are so convenient for laundry room storage but they definitely lack a sense of organization in their current state. Now it’s time to empty the space completely. Clear everything out so we can start to group like things together (the hallmark of any organizing process). 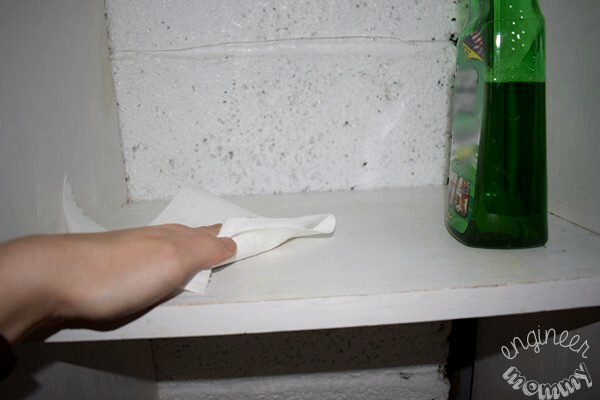 Before placing things back on the shelves, I like to wipe down all the surfaces with an all-purpose spray. It’s a quick, easy step that helps to create a nice blank slate when setting everything back up on the shelves again. 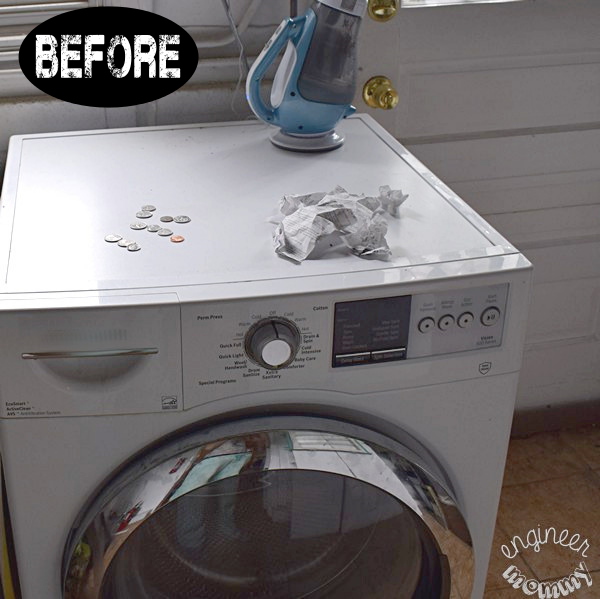 In my Before pictures, I mentioned that I had been collecting loose change & receipts on top of the washing machine. To streamline the look a bit, I grabbed these glass jars and designated one for all the coins and one for all the paper. The top of the washing machine looks much more intentional and tidy now! The simple steps make such a big difference. 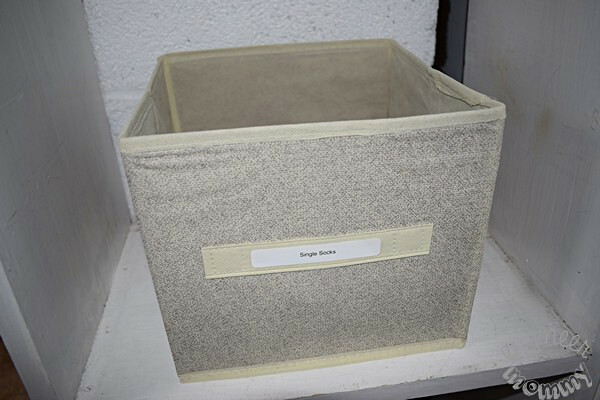 A set of of clean, labeled baskets goes a long way in making the set of shelves look well-organized. Let’s take a closer look at each of the shelves. I labeled one of the baskets “Cleaning Supplies” and I keep an all-purpose spray & roll of paper towels inside that basket. I labeled another basket “Miscellaneous” and I keep random items that may find themselves in the laundry room. For example, I have a lint roller and a a box of tissues in this basket. It’s great to have a basket like this to collect items that may need a dedicated space in the future. Remember those single socks in my Before picture? Well, the last basket is labeled “Single Socks” and it holds individual socks that I am holding onto until I can find the complete pair. On the top shelf, I placed a glass vase with some flowers. Yes, doing the laundry may be a regular chore, but if the room looks pretty & inviting, getting the clothing clean can be fun & enjoyable. You may see my favorite laundry detergent on this top shelf, too, which brings me to my next tip. 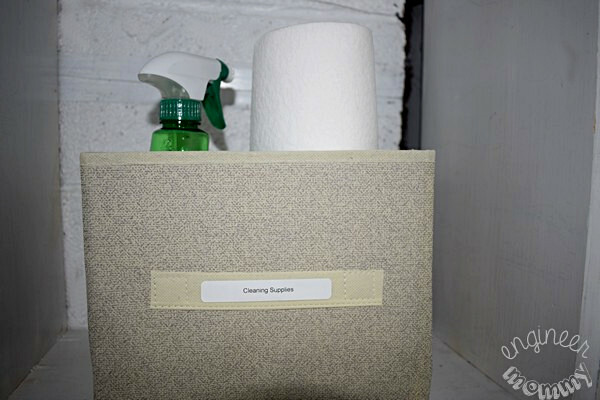 To keep clutter to a minimum, I tend to stick to effective products. For example, we love that the NEW sulfate free all® fresh clean ESSENTIALS® delivers a powerful clean without any harshness. I pour some of the detergent directly into the dispenser of my washing machine. This sulfate-free formula features effective ingredients for strong stain-lifting power on even the most stubborn stains. I love that I can always count on this product to get my clothing nice & clean! Be sure to follow the directions for use on the packaging exactly. 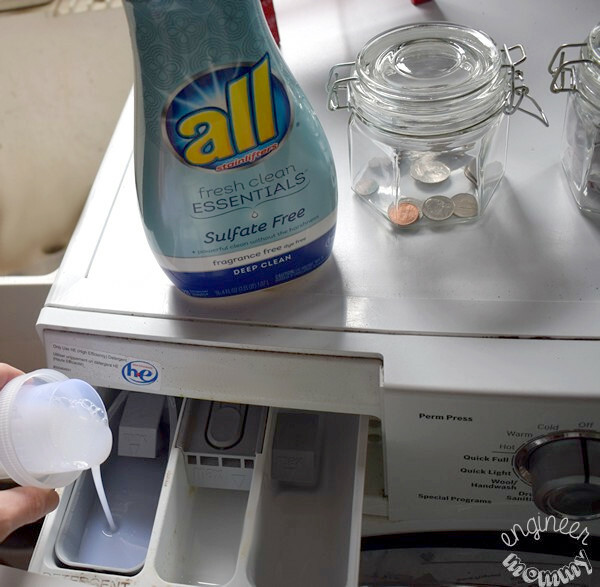 Did you know that all® fresh clean ESSENTIALS® lists the ingredients on the back of the bottle (one of the first laundry products to do so) so you know exactly what is washing your family’s clothing? I really love that transparency! By the way, there is a special promotion going on right now. With this coupon here, you can get $.50 off one (1) all® product! Please note that this offer is only available for a limited time while supplies last. 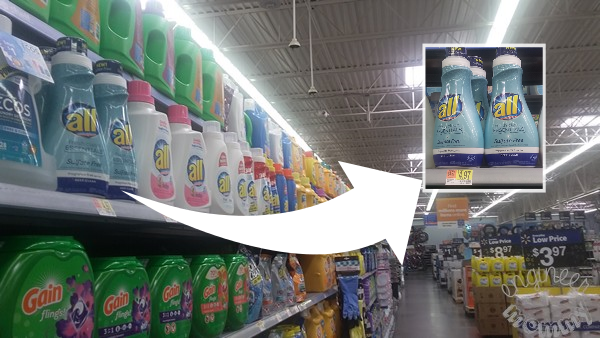 Look for all® fresh clean ESSENTIALS® on the top shelf in the laundry aisle at your local Walmart store. Keep up with the latest news & offers by checking out all® on Facebook & Instagram. The laundry room is on the lowest level of my home and the floor is tiled, so needless to say, my feet can get pretty cold in here. That’s why I added a cute striped rug in the room. Not only does it make the space more comfortable to be in, but it also adds a nice, decorative touch. I found this little chalkboard easel in another room of my house and decided it would make a great addition to my laundry room. Instead of always heading to the store for decorative pieces, be sure to check out other rooms in your house to see if you can re-purpose decor for different rooms. I added a cheeky phrase to this chalkboard and it always puts a smile on my face when I enter the room now. Want to overhaul your own laundry room (or any room of your house)? Download this free printable for the exact steps I used in systematically making over the space! Remember, the same process can work in any room! 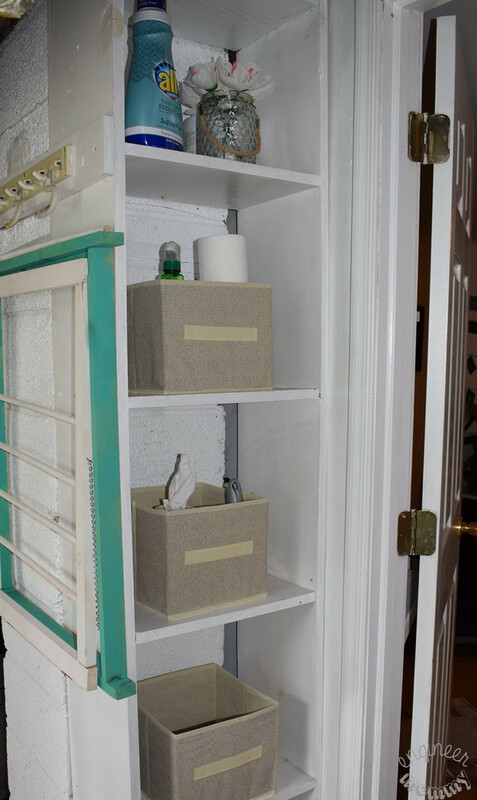 I hope these tips on making over my laundry room have inspired you. 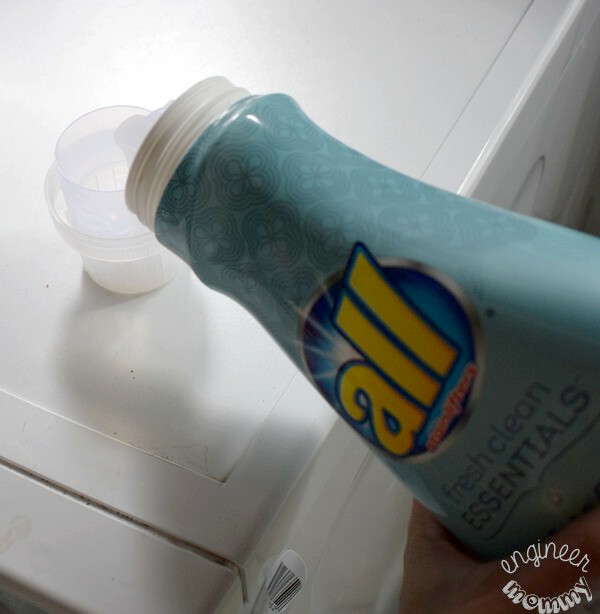 I really love how all® fresh clean ESSENTIALS® is free of sulfates, which is an ingredient I’m trying to eliminate in many rooms of my house. 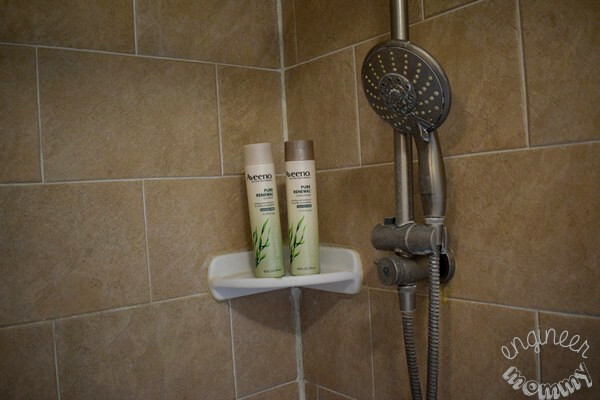 In my bathroom, for example, I recently switched over to AVEENO PURE RENEWAL® Shampoo and Conditioner. It’s very important for me to know exactly what ingredients are being put on my body, so that’s why I’m loving these AVEENO PURE RENEWAL® products. AVEENO PURE RENEWAL® Shampoo and Conditioner contain naturally derived cleansers and a sulfate free formula to gently cleanse your hair and scalp. These formulations rejuvenate hair to promote a healthy, balanced state. Did you know that AVEENO PURE RENEWAL® Shampoo and Conditioner are clinically-proven for sensitive skin and scalp? I love products that are backed by research! 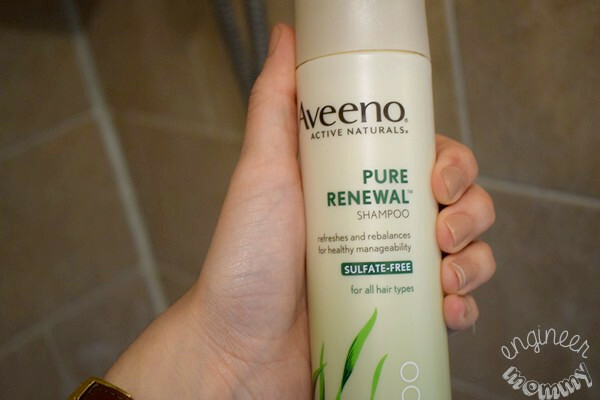 AVEENO PURE RENEWAL® Shampoo helps to cleanse my hair and get rid of everyday dirt, oil and styling products. Be sure to follow the directions for use on the packaging exactly. AVEENO PURE RENEWAL® Conditioner helps to add shine and moisture back to my hair, leaving my hair soft & manageable. 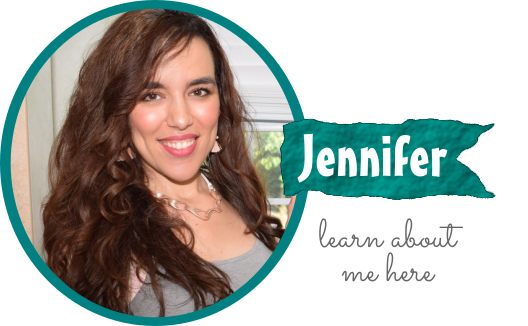 With these products on hand, I know I am working toward my goals of living a healthy lifestyle. By the way, there is a special promotion going on right now, where you can save $1.00 off one (1) AVEENO® product (excludes trial and travel sizes). Take advantage of this great coupon while supplies last. 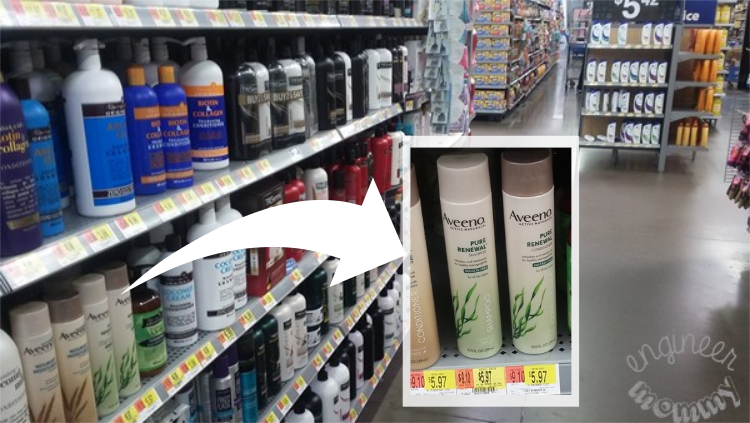 Look for AVEENO PURE RENEWAL® products in the Hair Care aisle at your local Walmart. 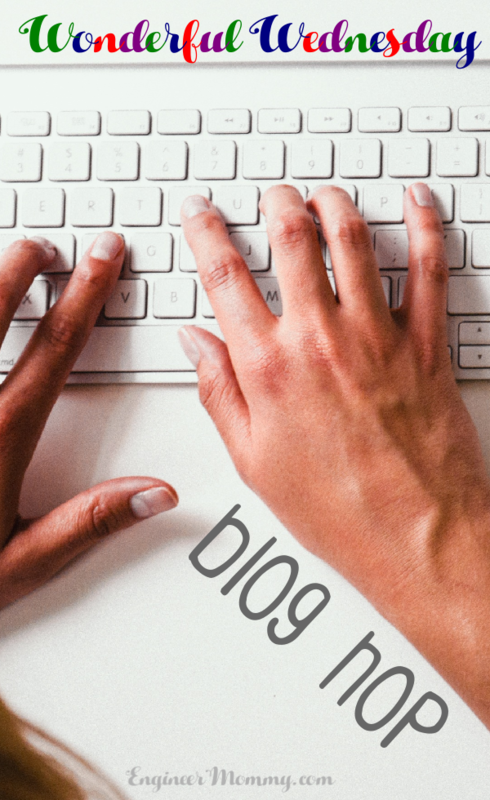 For the latest news & offers from AVEENO®, visit them on Facebook & Instagram. 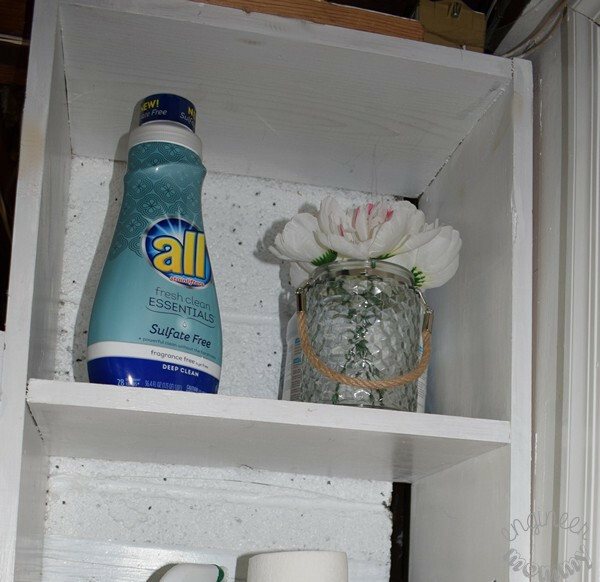 Learn more about streamlining your laundry experience with all® fresh clean ESSENTIALS® and tell me: Does your laundry room need a makeover? 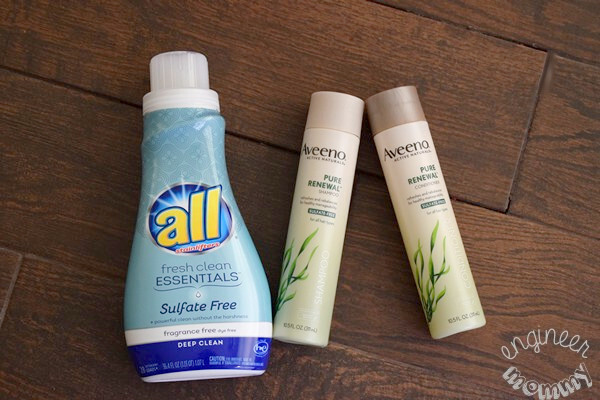 Are you trying to switch to sulfate-free products? First of all, I am jealous that you have a laundry room LOL. Mine is in the basement. I do love your makeover, though. it looks great. 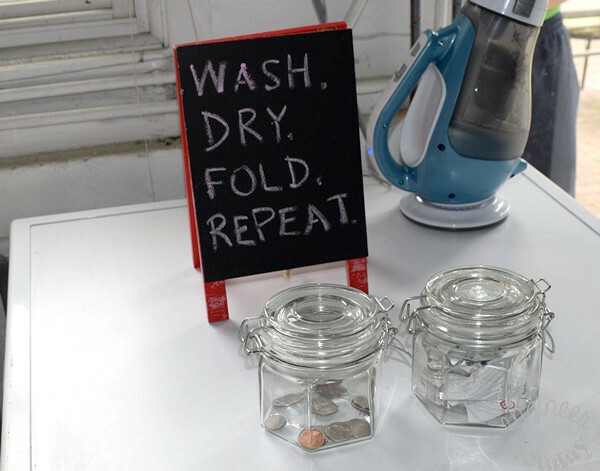 That is such a great idea for a quick and easy laundry room makeover! I always have change on the dryer. The jar is a cute idea. Oh my goodness how organised is your laundry room! I really need to get on top of my washing routine, I am so bad with it! 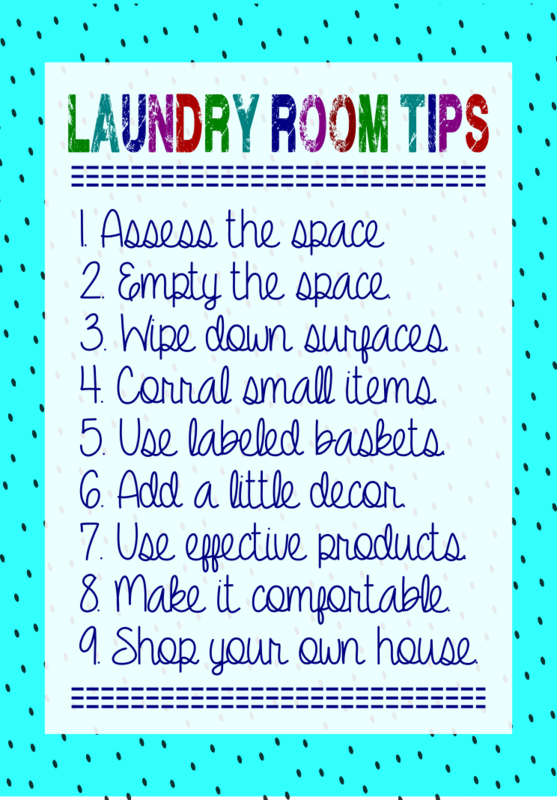 Our laundry area is rather small, but incorporating a few of these tips would really help us make the most of our space. I especially love those baskets! I really need to make over my laundry room. I need to get more storage space and just be more organized! Nice, my laundry room does need a makeover, that’s for sure. I’ll keep your tips in mind. I’ve been thinking about redecorating my laundry room for some time now! I think these are brilliant! It’s awesome that you added those storage baskets to the shelves. They’re pretty! 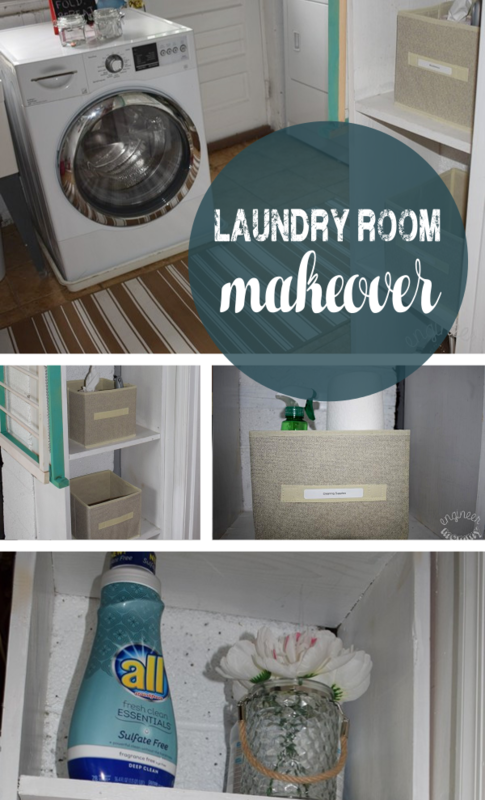 What a great and easy laundry room redo. I like the idea of shopping your house to find decor you can repurpose. 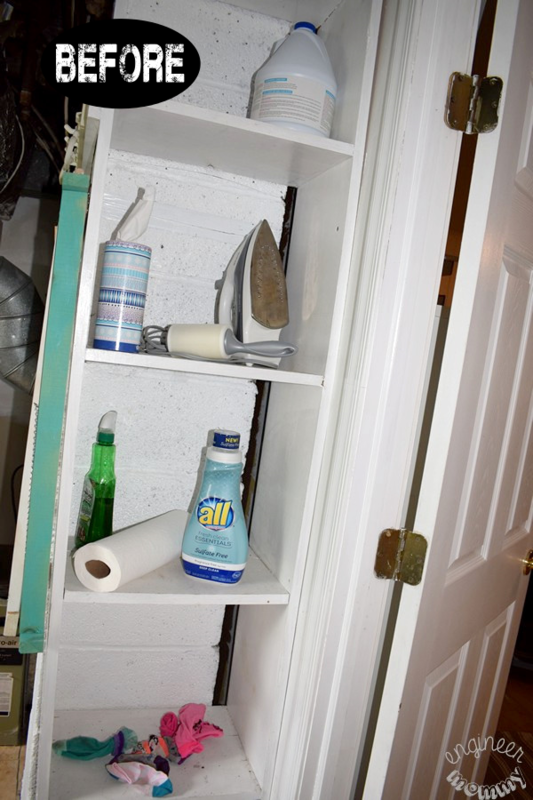 You did a great job in aesthetically changing the look of your laundry room! I took some inspiration from your post. I have been wanting to redo our laundry room for years. It really needs some attention. I just have too many other things on my list to work on first. Can’t wait till when I have a place of my own to transform to my taste. 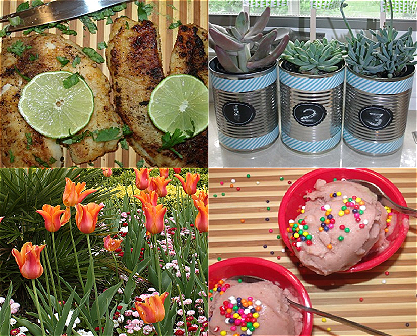 Love these great tips and the use of sulfate-free products. 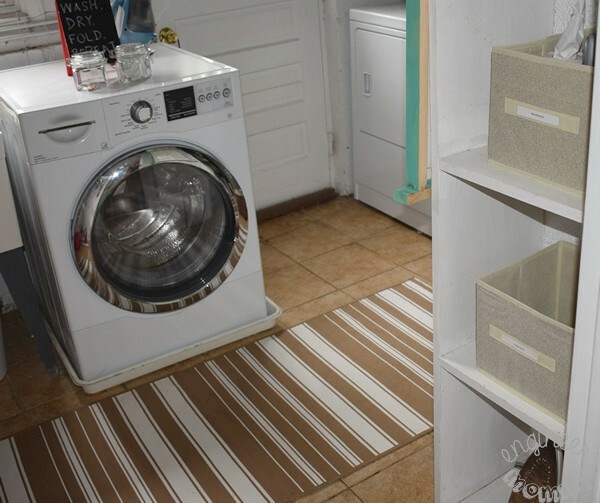 Reading this blog made me realize I have never intentionally try to decorate my laundry room. It would be awesome if I gave mine a makeover and I like the idea of a change jar. I love how organized your laundry area is! Mine definitely needs a make over. I mean, doing laundry is my least favorite household task. I should at least make that area more “inviting.” haha. I just love how your laundry room makeover went. I am starting to think that I might want to do more laundry if I had a more beautiful laundry room. Our laundry area is a mess! Since we manually wash our clothes here in the Philippines! Can’t wait to buy a washing machine like this! So we can toss away other stuff! Just goes to show that little changes can make a big difference! 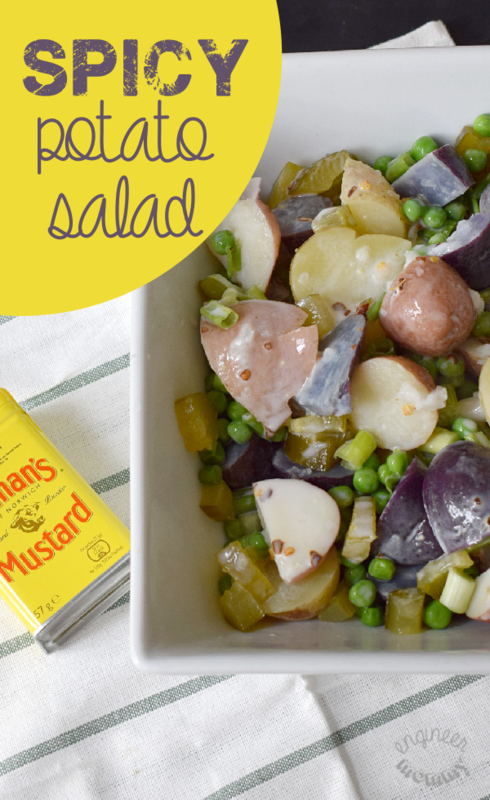 Love the tips and all the finishing touches you’ve made. I love how you labeled the baskets, I never thought of that before. We are currently working on our laundry room, hope to have it done soon. I love what you did to your. Thanks, Ivory! We really like the way it came out!